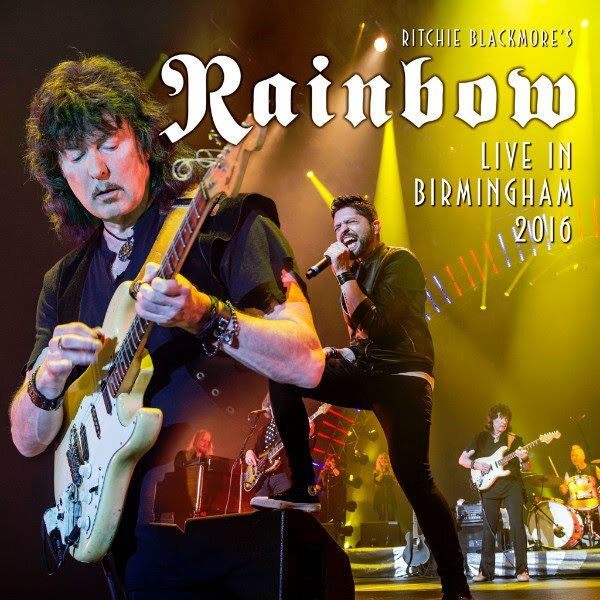 On June 9, Eagle Rock Entertainment will release the "Live In Birmingham 2016" 2CD by RITCHIE BLACKMORE'S RAINBOW. This is the first release for the audio of the 2016 British show which features performances of "Soldier Of Fortune" and "Burn" that weren't in the German shows. The amazing setlist also includes "Catch The Rainbow", "Mistreated", "Since You Been Gone", "Long Live Rock 'N' Roll", "Black Night", "Spotlight Kid", "Smoke On The Water", "Stargazer", "Perfect Strangers" and more! 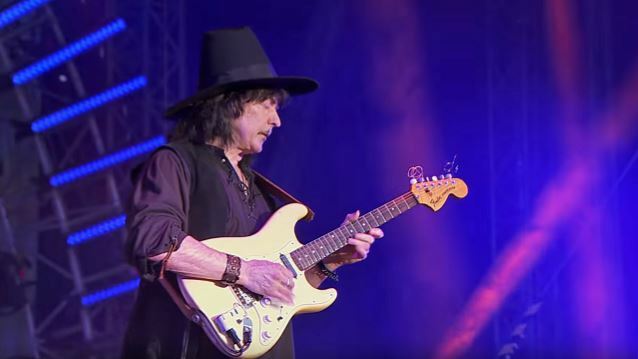 In June 2016, legendary guitarist Ritchie Blackmore made his much-anticipated return to rock music as RITCHIE BLACKMORE'S RAINBOW played three concerts in Europe, two in Germany and one in England. The two German shows at Loreley and Bietigheim were caught on camera to produce the concert film "Memories In Rock", which was released by Eagle Vision and Eagle Records in November 2016. This new 2CD set captures the full audio from the British show at the Genting Arena at the NEC, Birmingham. The band lineup for this incredible show featured Ritchie Blackmore (guitar); Ronnie Romero (vocals); David Keith (drums); Bob Nouveau (bass); Jens Johansson (keyboards); Candice Night (backing vocals); Lady Lynn (backing vocals). Blackmore spoke to the Dutch radio station Radio Veronica about what made him decide to play the recent RAINBOW comeback shows. He said: "Besides money, I heard the [new RAINBOW] singer, Ronnie [Romero, who is originally from Chile but now settled in Madrid, Spain], singing on YouTube. Candy [Ritchie's wife, Candice Night] had played it to me. She said, 'What to do you think of this guy?' And I don't go on the computer very much; I'm too old for that stuff. And Candy is often going on YouTube or whatever, and she said, 'He's singing some of your old songs, the RAINBOW songs.' And I heard them, and I went, 'Wow! This guy is really good. He's exciting.' And there had been some talk about reforming RAINBOW with David Coverdale and a few others — Glenn Hughes… Although they are friends of mine, I wasn't urgently involved in it. I was hesitating for probably a good part of a year before I kind of decided I wasn't gonna do it — until I heard this singer. As soon as I heard the singer, he had such a good voice, so much vitality, and that excited me. I thought, 'Wow! He's singing all the old songs, but he's doing it so well — old hard rock.' It was exciting to hear." Asked if he enjoyed the three RAINBOW comeback shows so far, Ritchie said: "I enjoyed especially the last one in England. The first two were a little bit intense, because we hadn't played together… we hadn't done a lot of rehearsing, so the first two shows were a bit hectic and chaotic. But the last one in Birmingham was… obviously, we'd played two shows at that point, and that seemed to work, to me. And it was great to see all the old people… I mean, it was so weird how… I think it was twenty thousand people… It sold out in fifteen minutes. And I kind of wondered who they thought was playing, 'cause when I got to the auditorium, it was so vast that I thought, 'Maybe somebody else is playing this show tonight.'" Regarding whether it was difficult for him to put together a setlist for the first three RAINBOW comeback shows, Ritchie said: "No. [It was] very easy, in a way. We had about fifteen songs that were very obvious songs to play, like 'Catch The Rainbow'. And we incorporated a few DEEP PURPLE songs — 'Black Night', 'Smoke [On The Water]', 'Highway Star' — of which some of the fans said, 'Why did you do those DEEP PURPLE songs?' And I would say, 'Why not?' And they said, 'Well, we thought it was just gonna be RAINBOW. We would prefer to hear [more] RAINBOW songs.' Which I thought was kind of ironic again. I'm thinking, 'Wow! We just threw three songs in by DEEP PURPLE when they wanted more [RAINBOW].' And I noticed when they clapped, they weren't clapping so hard for DEEP PURPLE [songs]. They said, 'We hear that every year,' 'cause [the current lineup of] PURPLE goes around [on tour]. So the next time, if we go out and we do anything, I would do probably ninety-five percent RAINBOW songs; that's what they seem to want to hear. And it didn't occur to me. I just naturally assumed they wanted to hear everything."